Overwhelmingly, there was one place that was recommended to us over and over again as we went through our weekend in Des Moines. Finding time to get to that place was another issue. Our fourth night in Des Moines was Friday night. We got down with our work downtown mid-evening then heading back out to our rental in Ankeny. A couple more hours of work sitting at the kitchen table led to discussions about food. It was about nine o’clock when one of my colleagues and I decided to head back downtown. The other guy had picked up Wendy’s on the way back to the rental and was fine with it. He still had some work that he wanted to get done before going to bed so he stayed behind. 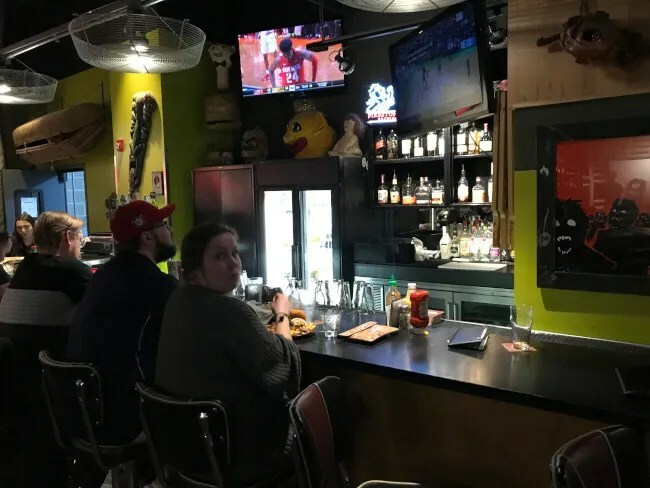 We headed back towards downtown Des Moines to find Zombie Burger + Drink Bar. We had heard so much about this place that we had to make the trip back in to the city. 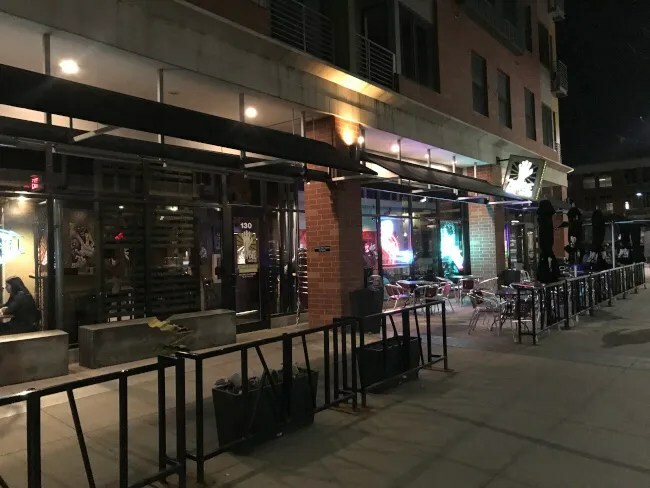 The restaurant is on the corner of Grand and 4th on the east side of the Des Moines river in the East Village area of the city. The restaurant looks to be part of a mixed used building in an area of Des Moines where we noticed a lot of bars and a lot of foot traffic on a Friday night. We got lucky and found a parking spot on the street right in front of the restaurant. As we walked in the door, there was a hostess station to the left. To the right is a quick service area that offers the same burgers with counter service but not the drinks. We were taken to a seat at the bar even though there were tables open. They were using the bar seats for small groups and saving the tables for four or more. The Ohio State vs. Iowa State NCAA tournament game was on which worked well for my Ohio born and raised colleague. 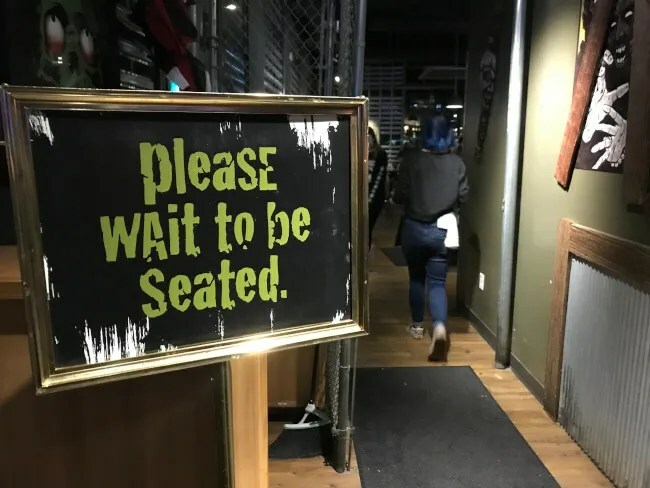 The restaurant has a zombie movie theme to it with paintings and other types of art depicting the undead throughout the space. The restaurant is kept pretty dark with hanging can lights, steal slats for walls over the floor to ceiling windows, and a dark wood floor. There are a number of local drafts on tap and we both picked the same one. 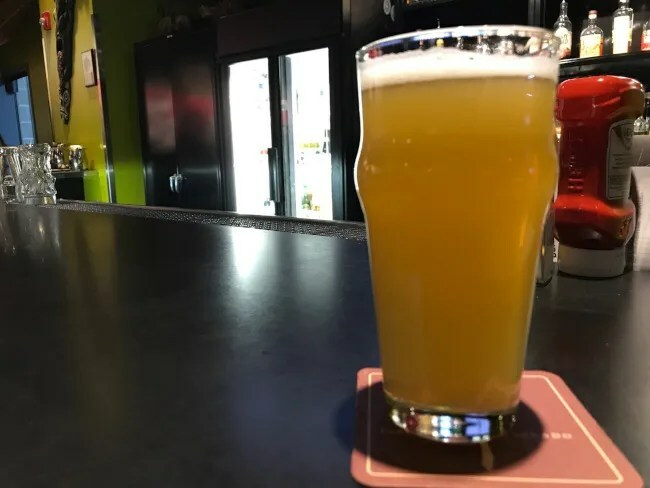 Sabro’s Sword is a New England IPA from Exile Brewing from right there in Des Moines. It’s a nice cloudy, juicy IPA that’s very sipable. All of the burgers have zombie movie or TV show themed names. I was going back and forth on a couple but it was almost a no-brainer for me to pick The Walking Ched. You get to pick how many patties you want and I went with two. Instead of bread, this sandwich’s bun is two deep fried mac & cheese discs. 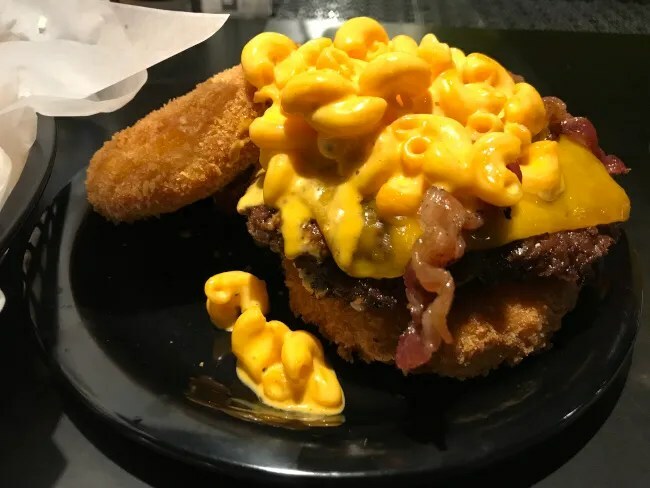 The burger is then topped with more mac & cheese, bacon, Cheddar cheese, mayo, and red onion. I can’t even begin to describe to you how good but heart attack inducing this sandwich is. There’s no real way to pick it up and eat so I grabbed a fork and went to town. The fried mac & cheese is soft and so cheddary. It’s got that electric yellow color that you get from the boxed stuff but this was clearly not that. The bacon and additional mac & cheese made this quite a filling meal on it’s own. It’s easy to forget this is a burger until you actually bite in to the meat which is really juicy and on the salty side. The mac & cheese dominates this sandwich but the burger stands up to the big flavors of everything surrounding it. Burgers are served a la carte so I added on a basket of fries because I severely underestimated how filling the burger would be. I did an order of the garlic, bacon, and bleu cheese fries. 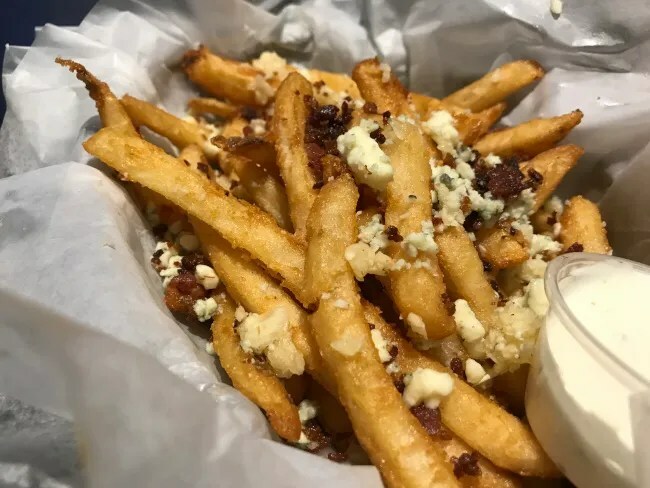 The fresh cut fries were covered in liberal doses of garlic, bacon bites, and bleu cheese. Garlic and bleu cheese may be the two best flavors ever and these toppings were even better on fries that would have been delicious on their own. The bill for my meal was just a little over $20 which really shocked me. My meal was worth much more than that and I was expecting it to be about ten bucks more. 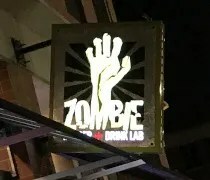 Zombie Burger + Drink Bar got so many recommendations from locals to fellow out-of-towners on this trip and it’s easy to see why. The burger was fantastic and there were so many other combinations that I would have liked to try. 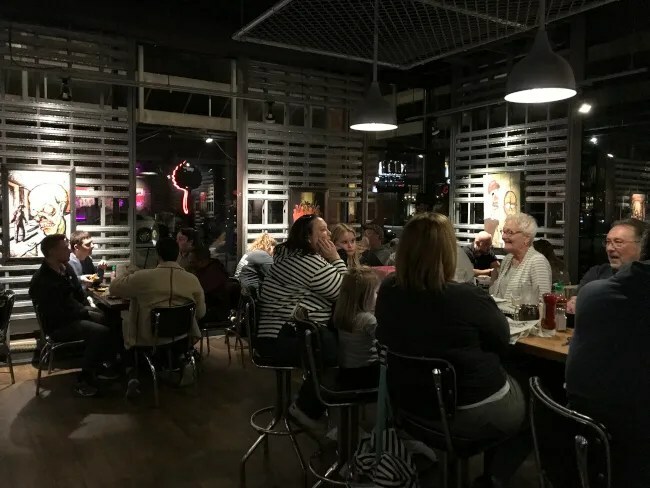 Zombie Burger would be a main stay in my dining out rotation if there was one in Kalamazoo and will be a must stop any time I’m in or passing through Des Moines in the future.